Word has been seeping out for a few weeks of some of the toy characters (on display at Comic-Con) being revealed through various channels of the pipeline that gets movie tie-ins to market. Now, made by Bridge Direct, they are for sale on store shelves in at least some locations including the new Toys-R-Us in Cherry Hill, New Jersey. Not only is it exciting to see new products (Tolkienites make great consumers!) but there are some clues about “The Hobbit: A Long Expected Journey,” and, our staff thinks, some false leads. But true or false, except for some glimpses in Peter Jackson’s production diaries, we have our first clear look of Evangeline Lilly as Tauriel. For those wishing to avoid spoilers, don’t look beyond the break! The process of merchandise hitting the market and spoiling some aspects of movies is inevitable and fun for consumers but maybe less fun for filmmakers who may want to keep a lid on every possible detail. Lilly’s character, a creation of the screenwriting team, has been mildly controversial as a character not created by J.R.R. Tolkien who wrote the children’s novel the trilogy of movies is based on 75 years ago. Many message board users at TheOneRing.net have taken a wait-and-see stance. TORn staffers also agree that there is a strong possibility that character Tauriel may not even show up in the first film. Marketing and merchandise plans were long in place, and likely manufacturing of toys and books as well, when Peter Jackson hinted at Comic-Con and then announced officially weeks later that his pair of movies based on Tolkien’s beloved book had grown into a trilogy. The toys plan was likely already in place, figures made and packaging cards printed with Legolas and Tauriel showing up in “The Hobbit: An Unexpected Journey,” before Jackson rearranged his films. Recent evidence, including the recently released trailer for the films, demonstrate that the initial film likely ends only five or six chapters into the book. Speculators guess Jackson will include a lot of backstory to set the stage for his trilogy in the initial film. This line of speculation leads to thinking that Tauriel and Legolas will appear in the second film, “The Hobbit: The Desolation of Smaug,” set for a December 2013 release. 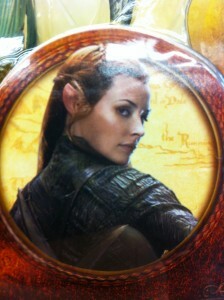 The inclusion of Tauriel and Legolas with merchandise labeled “An Unexpected Party,” could create a higher value as collectibles. The two forest elves, including Legolas (Orlando Bloom) from “The Lord of the Rings,” movie trilogy, also appear together as a character set, indicating the characters’ plot lines are intertwined. 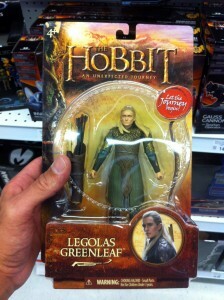 Legolas, while not appearing by name in “The Hobbit,” book is the son of Thranduil (Lee Pace), elven king. His appearance in the film, while not cannon, is certainly logical and perhaps even likely. His role in Jackson’s films are not yet clear. Other clues from the toy sets include the prominence of Fili (Dean O’Gorman) and Kili (Aiden Turner) who also seemed to get a little screen time than the rest of the dwarves. 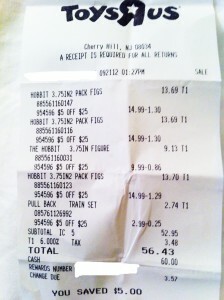 More items are expected to market around early October when TORn expects to be besieged by things Hobbit-related to buy. Also included in the gallery below are shots of Bilbo and Gollum and Thorin Oakenshield. Click the gallery images for larger versions. Enjoy the photos and the speculation and, if you find them on shelves near you, the toys!